In complex network research clique percolation, introduced by Palla, Derényi, and Vicsek [Nature (London) 435, 814 (2005)], is a deterministic community detection method which allows for overlapping communities and is purely based on local topological properties of a network. Here we present a sequential clique percolation algorithm (SCP) to do fast community detection in weighted and unweighted networks, for cliques of a chosen size. This method is based on sequentially inserting the constituent links to the network and simultaneously keeping track of the emerging community structure. 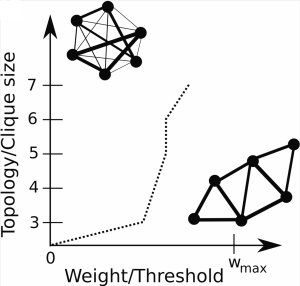 Unlike existing algorithms, the SCP method allows for detecting k-clique communities at multiple weight thresholds in a single run, and can simultaneously produce a dendrogram representation of hierarchical community structure. In sparse weighted networks, the SCP algorithm can also be used for implementing the weighted clique percolation method recently introduced by Farkas et al. [New J. Phys. 9, 180 (2007)]. The computational time of the SCP algorithm scales linearly with the number of k-cliques in the network. As an example, the method is applied to a product association network, revealing its nested community structure.